Many problem issues associated with Ceiling Fans can be attributed to the installation, and are easily corrected. Below is a general overview of the more common things missed, or done improperly when installing a Ceiling Fan. Motor size is the key to quality. Over time, it is not uncommon for smaller motors to develop sounds that are unrepairable. Below are a few tips that may help determine if that is the case. Switching: The use of a dimmer or rheostat wall control on the motor will cause any ceiling fan to "Hum". Ceiling Fan motors need to be run from a switch that has set speeds. SW95 or SW90 are switches that will work with most brands. Mounting: Anything not tightened properly may result in amplifying any sounds the ceiling fan might make. Make sure all screws and light fixture glass are tight. It is considered "Normal" to have a small bit of motion in any Ceiling Fan running on high speed. 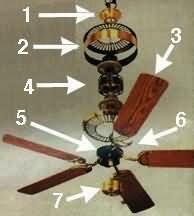 Blade balancing kits included with most ceiling fans, can reduce or eliminate this type of motion. Below are a few tips if the ceiling fan wobbles excessively. The easiest test for loose or poor mounting; Give the bottom of the ceiling fan a light push with your finger. On stem mount fans it should come back to center and stop. If the fan keeps moving, follow these tips for excessive motion. Mounting: The electrical box in the ceiling needs to be metal, and securely mounted to a joist or brace kit. The mounting bracket from the ceiling fan must be tight to the electrical box. Down rod or Stem: On ceiling fans with a down rod or stem. Make sure the groove on the ball at the top of the stem is aligned with the notch on the mounting bracket. There are usually multiple set screws to tighten at the ball and where the stem mounts into the top of the ceiling fan. Blades: Ceiling Fan blades are matched sets, weighted within a gram of each other. Loose or warped blades can be a cause of wobble. Make sure all screws holding the blades to the irons, and the blade assembly to the motor a tightened properly. To determine if you have a warped blade or bent blade iron: Use a ruler to measure from the tip of the blade to the ceiling. Let the blades pass by the ruler to see if one or more is higher or lower than the rest. There can be a slight difference in height that will not cause any wobble issues. Ceiling Fans that stop working, or fail to operate when first installed may need check a few basic things first. Wiring: Make sure there is power to the ceiling fan and the wall switch is in the "On" position. Follow the wiring instructions included with the fan and double check connections. Smell or Odor: Ceiling fans that give off a bad smell, typically need a new capacitor. Call us for identification remote systems: Make sure the receiver and transmitter are set to the same frequency, and wired according to the instructions. For receiver replacement, most ceiling fans use a receiver with the model number UC7067RC.